Jim Whitehead opened his own law office in Seattle, Washington, on January 1, 2008, after spending many years in practice in three other Seattle law firms, where he served as a partner or shareholder. He has represented both plaintiffs and defendants in a wide variety of injury and wrongful death claims, including maritime casualties, motor vehicle accidents, and accidents on commercial properties. In his maritime practice, he has represented numerous marine underwriters, including most of the world’s P&I Clubs, as well as leading seafood processing companies involved in the Alaska fishing industry, and has also represented Jones Act seamen, including Alaska fishermen and processors. Most of his personal injury work now is for plaintiffs. He has represented victims of medical negligence and malpractice and passengers injured on cruise ships and has also represented aggrieved workers who claimed violations of their civil rights and unlawful termination. In recent years he has represented domestic and foreign insurers in complex recovery cases involving damage to products during interstate and foreign transportation by land, air, or sea, and damage to perishables during controlled atmosphere or other storage conditions. I find my immigration work gratifying in so many different ways for the help I’m able to give people who are truly desperate for justice. 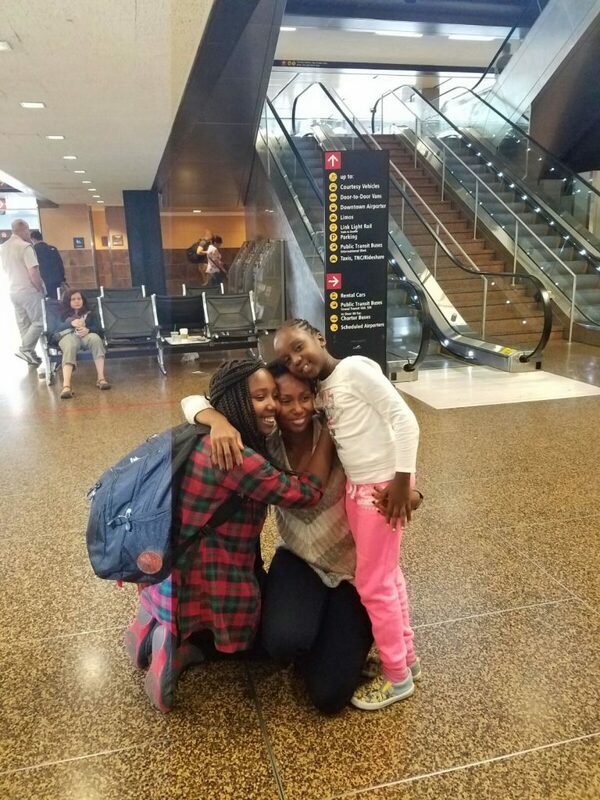 Below is a photograph of a client who was reunited recently at SeaTac with her two children, whom she had not seen for over a year. Her immigration application had to be granted before her children in Kenya could join her in the United States. She was nice enough to send me the photo and also to write a very kind review of me, which follows the photo. My husband Jim and I started this practice in 2008. We don’t just go through the motions (forgive the lawyer pun, please) in our work. We thoroughly enjoy what we do in trying to solve our clients’ problems, whether big or small. We provide free initial consultations to prospective clients who contact us, and we try to accommodate our clients and prospective clients by making house calls or meeting them at other locations more convenient to them than a trip to our office in Seattle, as their schedules and problems may require. We really enjoy trying to solve problems for our clients and shouldering some of the burdens that are weighing them down. We don’t always have the answers when we start a representation, but we try very hard to get the answers and to provide informative and useful advice to our clients throughout the handling of their claims, and we are always willing to take the claims to trial if we are not able to resolve them by other means.